Nebula Award Stories by Roger Zelazny, Sci Fi. Book is in good condition, all pages intact. A collection of short stories by varied authors, each title nominated for the Nebula Science Fiction Award. Includes titles by Harlan Ellison, Michael Moorcock, and others. 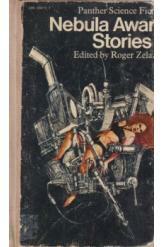 Edited by Roger Zelazny.